This unit, which pairs literature and visual art to highlight critical thinking and analysis skills that can transfer from one to the other, focuses on Passing by Nella Larsen, The Dew Breaker by Edwidge Danticat, and art from Romare Bearden and Chuck Close. The unit places these pieces in their appropriate frames of time period, geography, race/ethnicity, and identity in order to get the full experience that they have to offer in the classroom. These texts pose interesting questions on not just the central focal points of identity and point of view, but also on the ways societies have historically defined race and ethnicity and what it means to ‘pass’ in a different group in our own society. I also find the facets of identity presented in all of these works an interesting commentary on the construction of a self and how that self is perceived. I hope to give students the confidence to demystify multiple modalities of art for themselves and for each other, and to examine their notions of the ways that identity and perspective are created, maintained, and exploded. I love the connections that reading a strong piece of literature offers; particularly, I am amazed by the self-revelation that occurs after reading a powerful text—both for myself and for my students. I first read Passing by Nella Larsen as an English and Women’s Studies major in college and I remember thinking, I would love to share this with students one day. I consider myself lucky to be an English teacher because those are the terms in which I think of my daily life—‘sharing’ important pieces of literature with others, and hoping for occasional breakthroughs and revelations. When I reread Passing, I am convinced that it is the equal of the more popular Harlem Renaissance novel, Zora Neale Hurston’s Their Eyes Were Watching God, a now-accepted part of the modern literature canon. One interesting aspect of Hurston’s work is that the interaction between white and black is unspoken and almost non-existent; indeed, the novel is perhaps more accepted because it does not attempt to confront issues of race and racism. The passionate tragedy of Janie and Teacake is highly readable and beautifully written, and it makes an interesting pairing with The Great Gatsby by F. Scott Fitzgerald in an American Literature class focused on the 1920’s. However, the Great Migration, in which millions of African Americans moved from impoverished agricultural towns in the South to busy and industrialized Northern cities, and the efforts of prominent African American scholars and activists like W.E.B. DuBois and Alain Locke are unnecessary context in Hurston’s novel but serve as the basis for Larsen’s. The premise of Passing is historically and literarily important because of the way it addresses race relations and identity expectations, and it is no less passionate or tragic (though it is considerably shorter). I know that I have been successful as a teacher when a student recommends a work to me because of some spark that was ignited from a class discussion or interaction. That happened last summer when one of my newly-graduated seniors contacted me to discuss suggested reading outside of the classroom and mentioned The Dew Breaker by Edwidge Danticat as his college summer reading text. He enjoyed it and thought it was something I would like as well, so I put it on my long “to read” list and got to it this summer. I was intrigued by the story itself, particularly in its geographical transitions between Haiti of the 1960s, 70s, and 80s, and the modern day setting of New York; I was also impressed by the narrative techniques of point of view and structure employed by the author. I immediately decided that I had to share it with my students, and that it would make an interesting parallel to Larsen’s novel with a central focus on the social construction of identity and considerations for geography, time period, and historical context. Both texts are by female writers of color in which the historical and social contexts are key elements of understanding the full significance of the works. Another interesting literary connection is that in both novels, the main character does not narrate his or her own story; in a sense there is an identity created for that character through the eyes and perceptions of others. In The Dew Breaker, the title is a description of the main character, and he is unnamed. People who have known him or been affected by him reveal their personal stories, thereby revealing a secondhand knowledge of him. Irene Redfield is the third person focus of Passing, but the story really belongs to Clare Kendry. For both novels, the lack of voice for the main character creates another interesting parallel that can be examined through literary analysis. Then there’s the art. I have had an amateur’s interest in visual art for the last ten years. My first apartment in Richmond, Virginia, was within walking distance of the stellar Virginia Museum of Fine Arts, and it was a free cultural excursion that I frequently took. I developed a secret affection for looking at and privately interpreting a work, but I would never have offered my comments because of a lack of formal training. There were pieces and in fact, whole rooms that resonated with me, and for which I felt a deep affinity; I would revisit them over and over, thinking of them as my possessions that lived in this museum. I was intrigued by the Warhols and Lichtensteins, the Fabergés and Tiffanys, but also the pieces from Egyptian antiquity and the European sculptures of saints (St. Denis holding his own head continues to hold a morbid fascination). Even more than the individual pieces, however, was the connection to historical and social context. I loved wandering from room to room in the museum and travelling around the world and through time, marveling at how these pieces make historical and social comments on utility, wealth, values, and aesthetics. The beauty of this unit, however, is the focus on point of view as a mode of constructing identity, which allows both teacher and student to use the visceral reaction to a work of art, either on the page or on the canvas, as a starting point for genuine interpretation. Despite the fact that this is ostensibly a unit on visual art and literature, I really consider it a unit on history and context. One must necessarily place these pieces in their appropriate frames of time period, geography, race, and identity in order to get the full experience that they have to offer, and these texts pose interesting questions on not just identity and point of view, but also the ways societies have historically defined race and ethnicity, and what it means to ‘pass’ in a different group in our own society. I also find the facets of identity presented in all of these works an interesting commentary on the construction of a self and how that self is perceived. I hope to give students the confidence to demystify multiple modalities of art; in our increasingly interconnected and global society, being able to translate analytical skills from one field to another is a valuable quality and one that I as a teacher want to encourage and develop within my students. AP English Literature and Composition is traditionally taught in the twelfth grade and is designed for students to think critically about literature and develop analytical skills equivalent to a college literature course. This is my fifth year of teaching the course and I am currently teaching my third incarnation of the syllabus, which has had course themes of identity and alienation, death, and now identity and perspective. AP students are generally high-achieving, goal-oriented students who are accustomed to being successful at school. The College Board must approve the syllabus of the course, and students are expected to take the AP exam in May; a successful score is one that will gain college credit, typically a 4 or 5 (on a 5 point scale). Myers Park is a large urban school in Charlotte, North Carolina; nearly 3000 students come onto our sprawling college-style campus every day. The student population is diverse; the school is located amongst some of the most expensive real estate that the area has to offer, yet 30% of our population is on free/reduced lunch. We house successful AP and IB programs as a neighborhood school, and have been recognized as one of the top 100 public high schools in America for several years in a row. Students who take my AP English class tend to be white, wealthy, and native to Charlotte. While this is a broad generalization, it is important to recognize the point of departure for them when considering the wide range of perspectives contained within this study. My desire as a teacher and for this unit is to challenge students to evaluate point of view via the literature and visual art as a means of evaluating their own points of view. I hope that by the end of a year with me, students have actually thought about the experiences and beliefs that influence their independent perspectives. I am not seeking to change anything about their points of view, just raise awareness about it, and perhaps make them more empathetic human beings with a greater understanding for the different contexts that produce identity, society, and senses of belonging and alienation. They will necessarily use and improve their critical thinking and analysis skills in this course and this unit. The objectives for this unit are based on the concepts of point of view and context and how they impact identity. By the end of this six week long unit on an A/B day schedule, students will understand how context and point of view affect an interpretation of identity—for others and for ourselves—and how these elements can be examined in different art forms, both written and visual. My constant objective as an educator is to challenge the students to think critically, a skill which receives a significant amount of lip service but which has unfortunately been moved to the bottom of priority list because one cannot easily make, score, and compare critical thinking skills on a standardized test. However, I strongly assert that having high expectations and guiding students to meet them will provide a trickle-down effect for other educational objectives, including success on standardized tests. My interest is in examining how identity is constructed in this wide variety of texts, and how different filters of race, geography, and time period affect the narrative voice and the audience’s interpretation. The artists chosen are accessible, understandable, and challenging to me as a ‘non-artist,’ so my hope is that they will be accessible to the students as well. Students will become familiar with multiple types of critical theory in this unit. I generally operate from the Reader Response school which has become the dominant lens through which to filter texts at the high school level, and is practically demanded by the rigorous AP and IB programs. Students are expected to develop an independent interpretation of a text based on an understanding of literary elements and personal experience; a marriage of convenience for Reader Response and Formalism, if you will. It is certainly applicable here, because students will continue to maintain reader’s journals (which will also serve as ‘looker’s journals’ for works of art) and to consider specific literary elements, but they will also consider the socio-historical and biographical context that produced these works and artists. Students will analyze the texts in light of these contexts and evaluate the significance of such information to the works. Students will go beyond comprehension in understanding these texts; they will first compare the points of view and the narrative structure of the novels. In Passing, Larsen uses third person limited throughout the text. The novel is essentially told from Irene Redfield’s point of view, but ironically, Clare Kendry is the central focus—insinuating that Irene is not the main character in her own life and that Clare demands attention whenever she is present. The novel is broken into three parts: “Encounter,” “Re-Encounter,” and “Finale,” and each part is composed of four chapters. While the beginning of the novel references the girlhood in which Irene and Clare meet, the main plot centers around a number of months in their adult lives. One of the most interesting aspects of Danticat’s The Dew Breaker is the shifting point of view throughout the novel: the central character is unnamed (I will refer to him as TDB) and never tells his own story, but he is a key figure throughout the text. The narrative structure is best described as interconnected vignettes that, when read as a whole, create a fascinating and complex portrait of a man whose perceived identity seems to matter more than his own definition of self. Students will understand how the social constructs of the time had a defining impact on these characters, and leads to deeper philosophical questions about embracing or denying aspects of one’s heritage and how that affects identity. The teacher may choose to raise the idea of ‘passing’ in contemporary culture in terms of sexuality, wealth, or status. Some gay, lesbian, or transgendered people feel pressure to pass as straight, or someone living in poverty may wish to pass as middle or upper class. For example, my students began the year with the novel Old School by Tobias Woolf, which features an unnamed narrator at an exclusive boys’ prep school in New England in 1960. The narrator is able to attend on scholarship because he does not have the same background or level of wealth as his peers, but he is desperate to hide his poverty and acquire that appearance of disaffected affluence as his classmates. He writes prose and poetry that reveal part of his true background, but he hides those and publishes generic pieces that lack depth and fail to bring him a sense of satisfaction—until one day when another writer’s story about the same duplicitous lifestyle he has makes him question his decision to hide that part of his identity. My students discussed the different aspects of the narrator’s identity, including his public self, his private life, the contrast of the two, his decision to hide part of his identity, and the conflict that arises from it. This discussion is at the discretion of the teacher and depends largely on the atmosphere of acceptance and maturity level in the classroom. Setting is no less significant to The Dew Breaker, which spans approximately forty years and two disparate countries. While more than half of the novel takes place in the United States, the issue of Haitian identity and politics must be addressed in order to fully understand the impact. The title of the novel, “dew breaker,” is Danticat’s translation of the phrase “choukèt lawoze” and refers indirectly to the Tonton Macoutes, the nickname for the violent Militia of National Security Volunteers which maintained the oppressive regime under Francois Duvalier, known as Papa Doc, from 1958 until his death in 1971. His son Jean-Claude “Baby Doc” Duvalier took over and used the same institutional terrorism against his people until the militia’s loyalty to him faded and Duvalier fled the country in 1986. The ensuing chaos from his departure is described in the chapter “Monkey Tails,” in which a boy is concerned for his friend whose father was a well-known Macoute. Tonton Macoute (“Uncle Gunnysack”) is a familiar character is Haitian legend; he is a bogeyman who comes in the night and takes away misbehaving children from their families, never to be seen again. It is interesting to note that the name comes from Duvalier’s perspective, who considered those who stood against him to be like ‘misbehaving children’ who needed discipline. The reader sees the long-term impact of TDB and his ilk in chapters like “The Bridal Seamstress,” about a Haitian woman who has moved to the United States but is haunted by the memory of a single encounter with a militia man and, ever since, “[she] finds him, living on [her] street.” The reader is forced to wonder, like the chapter’s narrator, whether the old woman is paranoid, but the fear is real. The pairing of these two novels was done purposefully, but perhaps peculiarly. As soon as I entered the seminar, I knew I wanted to use Passing because it is a text I have wanted to teach for several years but never worked into the curriculum; I thought it offered a significant point of view on the issue of identity, and the way that Larsen constructs Clare’s identity could easily be connected to the way a visual artist constructs a painting. Additionally, the College Board requires that students read both wide and deep, and this little gem from the early twentieth century offers ample opportunity for both. Once I focused on the central issue of identity and perspective, I could not imagine the unit without The Dew Breaker. It has some similarities to Passing highlighted in the paragraphs above, but it’s also about the divergence between the two works: both women writers of color, but at different ends of the twentieth-century. Both texts deal with the issue of how an identity is constructed and how it influences the world of the novel, but in entirely different ways. Social repression is represented in both novels but in Passing, it’s all about the historical context of being an African American woman in the 1920s, and in The Dew Breaker, it is the dictatorial regime of the Haiti that has left its mark on its own people. By pairing these two novels, it allows the students to see and react to how these authors make the issue of identity and perspective historically-situated and contextually significant in their pieces of literature. The inclusion of visual art in this unit is not a sidenote or a mere nod to different learning styles; it is a purposeful and important element designed to expand these connections of point of view and setting beyond the written word. As the students consider the significance of point of view as it connects to the concept of identity in the two novels, they will also examine a number of visual works that tie to this theme. The unit will provide a guided interpretation of two artists, Romare Bearden and Chuck Close, and will end with a field trip to the Bechtler Museum and the Mint Museum Uptown in which students will examine and interpret art for themselves, using the skills gained during the unit—this is further described in the ‘Strategies’ section. Last year at this time, I had no idea who Romare Bearden was. Over the last several months, however, his name and artwork have been impossible to ignore in Charlotte. 2011 is the centennial anniversary of his birth here in Mecklenburg County, and after attending a retrospective of his life and works, I became intrigued with his style of collage and particularly in the art that showcases Southern life from an African American perspective; pieces like “Mysteries” (1964) and “Mecklenburg Early Evening” (1982) highlight these elements of identity and perspective being tied to a particular geographic location and even time period; his method of collage and primitive styling can be interpreted as a disjointed or fractured sense of identity, which pairs beautifully with the ways that Larsen and Danticat offer multiple perspectives on identity. Another interesting connection is that while Clare Kendry grew up as African American but passes as white, Bearden was quite light-skinned and could pass as white, but he was deeply connected to the African American community and the people of color in his art are just that: colored, and while shades are offered, there is no question the subjects are African American—in this sense, the characters in Bearden’s art are more secure or tied to their identities than those in Larsen’s novel. I have been intrigued by Chuck Close’s work for several years; I saw an exhibit of his work at the Virginia Museum of Fine Arts and I was fascinated by the photorealism—his paintings are so lifelike it can be incredibly difficult to tell the difference between it and a photograph. When looking through his body of work, however, there is a radical shift in style; his paintings went from hyper-realistic to an abstract portraiture: very close up, the paintings are grids of circles and squares but at a distance, the image of a face becomes clear. I find both types of his art to connect to this unit in different ways. The intimacy created by his larger-than-life photorealistic portraits invites the stare of the audience; his subjects are portrayed fully forward, seemingly unabashed and secure. This is, however, a contrivance of the artist which will be explored further in a study of the painting “Keith” in the activities section—the identity of the subject is manipulated by the artist in such a way as to seem honest and objective, but is a construct of both the artist and the audience in much the way that Clare and TDB are. Regarding Close’s grid-style portraits, one might argue that they are more realistic, or human, because it offers a disjointed or, at the least, faceted sense of identity. No single element makes up the subject’s face; rather, s/he is a compilation of hundreds of shapes and colors that only form a concrete image when seen from afar. This is particularly applicable to The Dew Breaker; examining any one of the vignettes within the text only offers a tiny view of the identity of the main character, but when the novel as a whole is taken into account, a more holistic and realistic image of a man comes to light. I began college as a history major and switched to English when I realized two things: how desperately I missed the study of literature, and how the social context of a time period was not as important to being a successful history student as memorizing dates of wars and names of generals. My desire to integrate the two is a fundamental part of my identity as a teacher, so the necessary background information for this unit will include biographical and historical context for the works and artists. Romare Bearden was born in Charlotte, North Carolina, in 1911 to Howard and Bessye Bearden, both college-educated and successful. In 1914, as blacks across the South moved to the less restricted North in what became known as the Great Migration, the Beardens moved to Harlem in New York. As a child and teenager, Bearden spent time with relatives in both Charlotte and Pittsburgh which influenced his later art immensely—one may look at his series “Mecklenburg Morning” and “Pittsburgh Memories” as examples. It is important to note that Bearden lived the Harlem Renaissance; his parents were well-known and connected, and Bearden had contact with famous artists like Langston Hughes and Duke Ellington, among others, who clearly had an impact on his style. Modern art stylings like Cubism and contemporary jazz music influenced his art as seen in works like “At Five in the Afternoon” and the “Of the Blues” series. He graduated from New York University in 1935 having already begun a career as a political cartoonist for The Crisis, the journal sponsored by the NAACP, but in the 1950s, transitioned to his signature style of collage which serves as a strong connection to this unit. Throughout the 1960s and 70s, Bearden gained national attention and subsequently fame as an artist, and in the 1980s, had several retrospective shows. In 1987, he received the National Medal of Arts from President Reagan before passing away in 1988. While Bearden looked to the old masters and fellow contemporary artists and musicians for inspiration, he is recognized in the art community for developing his own style of collage which he called “photomontage projection.” For the purposes of this unit, I will focus on his collages that reflect major themes of his work: rural life in the South and point of view. I am interested in the sense of a fragmented identity that is conveyed through collage, the influence of his background and personal life, and the symbolism embedded in Bearden’s works. One of the pieces I am most intrigued with is Mysteries from 1964. One must remember that the 1960s was a turbulent time in the United States: protests surrounding American involvement in Vietnam, a growing rejection of the traditional gender roles for women, and a battle over civil rights for African Americans. During this year, college students volunteered to travel to rural areas and sign people up to vote, which resulted in violence and deaths; it was also the year President Johnson signed the Civil Rights Act, which created legal protection from discrimination for men and women of color. A collage in tones of black, white, gray, and brown, the image shows four women of color and a baby in a rural, probably Southern, setting. The women, particularly their faces, take up the majority of the space, but one can see a house framing them—composed of corrugated metal, clapboard, and newspaper—and another frequent Bearden image, a train, in the background. The eyes of the women are particularly engaging. They stare directly at the audience and both express and invite a variety of emotions, but not pity. There is perhaps a defiant attitude displayed in the piece that asks the audience to identify the reality presented without allowing one to feel sorry for the women on display. They recognize the stare of the outsider and stare back. Fellow artist Chuck Close was born in Washington in 1940. He became interested in art as a teenager after seeing an exhibit on Jackson Pollock; he earned art degrees from the University of Washington and Yale, and he travelled to Vienna on a Fulbright Scholarship in 1964. It was as a professor at the University of Massachusetts at Amherst that he began creating giant portraits in the photorealistic style for which he is famous; throughout the 1960s and 70s, he worked in black and white and moved to color in the 1980s. Close has been diagnosed with both dyslexia and prosopagnosia—“facial blindness,” an inability to recognize or differentiate facial features—which may explain why the enormous portraits are his signature style. In 1988, Close suffered from a “spinal stroke” which caused a seizure and paralysis. Through rehabilitation, he regained some control and movement of his arms and he continued to paint. In the 1990s, however, his style radically changed; instead of producing large facial portraits that could be mistaken for photographs, he began producing portraits made up of thousands of tiny grids that, up close, look like abstract art but when viewed from a distance, create a clear image of a face. In 2000, he joined the ranks of Bearden and others by receiving the National Medal of Arts from President Bush. Considering the focus of this unit is on identity and perspective, it may seem gratuitous to include an artist whose work focuses on what might be considered the most basic form of identity: a person’s face. Beyond a name, a face is the most simplistic way to recognize and connect to a sense of identity. It is, however, this very idea that Close manipulates and that made me interested in his work as part of this unit. There are similarities among all of his works that can draw in any critical thinker: the size of the art, the focus on the face and shoulders, the expression of the subject. One can then discuss the difference between a photorealistic piece, like “Keith,” and compare it to a grid-style portrait like “Lucas.” One key difference between these two is the subject’s focus. “Lucas” looks directly back at the audience with a powerful intensity; the attitude conveyed is one of control. In “Keith,” however, the subject does not meet the audience’s gaze. He looks off to the distance above the looker. If “Lucas” conveys power, “Keith” may be interpreted as shy or even ashamed to be the focus of the gaze. This focus on the subject and the gaze offers a very basic lesson on the two key elements of identity and perspective. Edwidge Danticat is the youngest artist and thus her biography is, thankfully, incomplete as she continues to work and publish. She was born in Port-au-Prince, Haiti, in 1969. Her parents immigrated to the United States shortly after she was born and she was raised by an aunt in Haiti until the age of twelve, when she joined her parents in Brooklyn. She has degrees from Barnard and Brown and was a recipient of the MacArthur Fellowship in 2009, which comes with a $500,000 creativity grant. She has published seven books and written and edited a number of essays and anthologies. The major themes in her work include oral history, Haitian folklore and mythology, and collisions of culture. As an immigrant to New York and living in a Haitian-American neighborhood, she has personal experience with what it means to be suspended between two worlds, and there is a strong element of personal truth in her books, including The Dew Breaker. The daughter of title character is an artist—although visual, not literary—and tries to use her medium to represent what she believes her father’s reality to be. It is a shocking turn of events when she realizes the difference between her perception of her father’s identity and the reality. Nella Larsen’s biography has a necessary role in understanding the tone and focus of her novel but it is quite a mystery with few facts and many unsubstantiated rumors. I came across three interesting, and sometimes conflicting, biographies of Nella Larsen: Nella Larsen, Novelist of the Harlem Renaissance: A Woman’s Life Unveiled by Thadious Davis, In Search of Nella Larsen: A Biography of the Color Line by George Hutchinson, and Invisible Darkness by Charles Larson. She was born in Chicago, Illinois, in 1891 to Mary Hansen, a white Dane. Nella is classified as “colored” on her birth certificate; the prevalent claim that her birth father was West Indian is most likely “a fabricated story for romantic purposes” according to Larson, and a family friend stated that “her father was a black American who was a chauffeur.” Her mother married a man named Peter Larsen, a fellow white Dane, in 1894. Larsen was the father of Nella’s half-sister, Anna, and there is conjecture that much of the unsubstantiated and potentially false background put forth by Nella Larsen herself is a result of a childhood in which she felt isolated and alienated from her own family because of her birth father’s race and her darker skin tone, with which she could not pass. What is known is that she was schooled in Chicago and attended Fisk University in Tennessee for two years before going to New York and studying nursing. She had careers as both a nurse and a librarian before meeting and marrying Elmer Imes, a physicist, in 1919. They moved from Jersey City, New Jersey, to Harlem in 1924 and Larsen turned her focus to writing. Quicksand was published in 1928, followed by Passing in 1929. She won the Harmon Foundation’s Bronze Award for Literature and a Guggenheim Fellowship based on the strength of these two works, and never published a novel again. She divorced Imes in 1933 (he was accused of an affair with a white colleague at Fisk University), had progressively less contact with family and friends, and was found dead by her apartment building superintendent on March 30, 1964. Many people argue that Larsen’s first novel, Quicksand, is essentially a veiled biography. However, the novel at the focus of my unit has some interesting overlaps as well. There is the notion of ethnicity and race, which has a central role in Passing and in Larsen’s life. 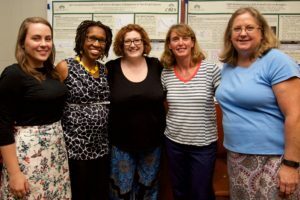 When Irene Redfield is having tea with two black women who have passed and married white men, there is a discussion of the fear relative to having children and why each woman has only been pregnant once: “I’ll never risk it again. Never! The strain is simply too—too hellish” and “No one wants a dark child” are sentiments stated as facts. At this point, Irene reveals that one of her children is “dark,” and “her husband…couldn’t exactly ‘pass.’ ” This issue of not just race but on shades of light and dark is the foundation of the novel and the idea of passing. Larsen was dark enough to not be able to pass, and as the only person of color in her family, it makes sense that she might have felt isolated and perhaps alienated. First and foremost, my duty as an AP Literature teacher is to teach students analysis skills that can be applied to practically any field of study. While I am personally saddened that not every student leaves my classroom with the intention of declaring an English major, I know that the important skills will translate to their chosen path. The College Board requires that I challenge the students with interesting and complex texts that provide ample opportunity to interpret and analyze literary elements; students develop and hone those skills via active reading strategies, class discussion and seminar, and written responses. Class discussion is a term I use for informal assessment nearly every day; students may ask questions of me or each other and we will take ten to twenty minutes to address issues of comprehension. Socratic seminar, on the other hand, is a pre-planned strategy in which the teacher facilitates discussion via guiding questions, but the students direct the conversation and are encouraged to ask questions of each other; it is designed to increase student ownership over their learning and to focus on interpretation and analysis. I would employ Socratic seminar at the end of a text, or to talk about the texts and a specific work of art together. An effective Socratic seminar should take no less than thirty minutes and should allow the opportunity for all students to speak. Unfortunately, class sizes in my district are now around forty students, so I have implemented a strategy used by my colleagues in which two to three circles are created and the inner circle is when and where students can speak. For example, in my class of 41, I would use three circles of around thirteen students. Students in the outer circles are expected to listen carefully to the discussion and they write down responses to the current questions, and thoughts or questions to ask once they are in the position to speak. Students are required to have their texts with them and may use the novel to provide concrete support for their interpretations. I believe it is important to respect any interpretation of the novel that is based on the text and shows a thoughtful, personal response; the greater value of seminar is that students direct the conversation and teacher truly is a guide who offers direction, but allows students to agree or disagree with each other. Prior to beginning a seminar, students are asked to agree to certain ground rules, like not speaking over each other and responding respectfully, and they may add personal goals as well, such as speaking at least twice and asking a question of the group. 1. What is the speaker’s comment on identity? 2. In what ways can the title be interpreted? How does the poem’s attitude toward race and identity connect to either novel? What literary techniques do the writers use to create identities for the characters? What do the novels share in terms of identity? Where do they diverge? How does perspective affect your interpretation of the characters? How does historical or social context affect the main character’s identity? What is the impact of passing in both novels? How does it affect the main character, their families, and their communities? What effect does the narrative structure have on each novel? How do these novels connect to each other in other ways? What do you take away as their literary significance? Post-seminar: Students will write a response to the seminar process and their personal role, and comment on its effectiveness in illuminating new meaning or interpretations on the novels. In the past, this has been a successful activity that even further highlights the issue of perspective and point of view, because teenagers often have a hard time seeing past their own. Listening and responding to each other—rather than the teacher—can offer a substantially important learning experience. Students may also set goals for future seminars, building a sense of self-awareness in terms of their role in the discussion. How many people are in this piece? How would you describe their appearance and gaze? What are you aware of when looking at this piece, and what are the characters aware of? What is the setting? How important is the geographical and time setting here? What effect does the style of collage have on the tone of the piece? What connections do you see between this text and the novels of Larsen and Danticat? What similar themes do they deal with? What would you assume about this man’s identity based on this portrait? What do you notice about his eyes? His face? Keith Hollingsworth, the subject, has said, “It was hard for me to look at the finished work. But this was mainly because of my facial paralysis, as I hadn’t come to terms with it. In the long run, it was also difficult to understand that “Keith” and I had become two completely separate entities.” What do you think he means by “two completely separate entities”? What is he telling the audience about the significance of the portrait and his personal identity? How can you create connections between Close’s art and Bearden’s, particularly in terms of identity and perspective? What impact does the radically different style have on you, the observer? Does it create a different sense of identity for the subject, even though it is the same person? What do you think of the fact that they are self portraits, created by the artist? Does that influence your interpretation of his identity? Do you notice a difference in the tone between the self portraits and “Keith”? Could one argue the artist was gentler or kinder toward Keith’s portrait? What connections do you make between all of these artists—Larsen, Danticat, Bearden, and Close? In particular, what commentary is made on identity and perspective? Are there any similarities in terms of construction of an identity? How does perspective influence how you interpret their art? How significant is setting and ethnicity for each artist? From the beginning of the year, I try to establish myself as a learner alongside the rest of the students. My authority comes from a significant amount of time spent in the critical study of literature—which is exactly what they are doing—not from some special curriculum book handed down from the heavens (which is what I thought until I entered education classes). This particular unit will highlight my role as co-learner, because I am certain that there are students with more art knowledge than what I possess. The key will be for students to recognize parallel constructs of identity by using point of view and structure (for art, this will be color, form, materials, etc.) from the page to the canvas. One of the most important activities for this unit to be complete is to visit the art. While viewing slides on the LCD projector in the classroom can be useful as opening or transitional activities, it is critically important that students have the opportunity to get out of the classroom and visit a museum. I am very lucky in that one of the artists for this unit, Romare Bearden, is currently on display in my city because it is his centennial birthday, and Charlotte is his birthplace. Both the Mint Museum Uptown and the Harvey B. Gantt Center for African-American Arts + Culture are currently hosting exhibitions featuring Bearden. I would like to note, however, that there are any number of artists that have used the theme of identity, the method of collage, or simply provide an accessible point of departure for a discussion on the connection of perspective within visual and literary art. I encourage the readers of this unit to research their own local art museums for an artist or exhibition that would lend itself to this discussion. There are no current exhibitions or even independent pieces of Close’s work that are available in my area for viewing, so students will be studying his art in the classroom. When we go to the local museums, however, I am certain that the students will be able to make connections between what we have seen in the classroom to other artists and works. My students will go on a field trip to the Bechtler Museum of Modern Art, the Mint Museum Uptown, and the Harvey B. Gantt Center to experience art. I have two activities: first, students will find a piece at each museum that creates a personal connection to their own identities. Using their journals, they will note the piece’s title and creator and perhaps draw their own version, then they will write a short response on how that work connects to a personal sense of identity. It may be the style, the artist, the colors, the structure, or any number of creative elements that we have discussed in class that may lead the student to feel a connection to that particular piece. I’m not interested in the student’s analysis of the artistic composition; rather, I want to see what skills the student has gained in focusing on identity and perspective and how s/he can recognize that element within a work of art and make a personal connection. This is a very personal response and with a small, intimate class, the students might feel comfortable sharing their piece and the personal connection with the group—I do not think this is necessary for the activity to be successful, however. The second activity is similar: ask students to find a work of art that connects to either Passing or The Dew Breaker. This can definitely be shared with the class as it will make students accountable for their decision and have to articulate what they saw in the art that sparked a connection to one of the novels. Students will note the work’s title, artist, year of creation, and medium. Students will describe what they see when they look at the piece, and finally, they will explain how the art connects to one or both novels. After thoroughly discussing so many different aspects of the texts, in terms of comprehension, analysis, significant elements and themes, students should feel a sense of confidence when explicating the relationship they see between the different types of art. Danticat, Edwidge. The Dew Breaker. New York: Random House, 2004. Danticat’s novel is a recent publication which has both benefits and drawbacks: it will be expensive to purchase (list price is 14.00) but there are not many materials available online for students to “borrow” from. I find that with these novels, their interpretations tend to be much more personal and organic, rather than scripted by Sparknotes. Farley, Todd. “Larger than Life.” Neurology Now (August/September 2011): 14-19. This is a short article, recently published, that gives an easy, understandable overview of Chuck Close’s life and art. It focuses on the neurological disorders that have influenced his art, including facial blindness and “the event,” which is what he calls the seizure that caused his paralysis. This is a great and accessible resource for teachers and students. Hutchinson, George. In Search of Nella Larsen: A Biography of the Color Line. Cambridge: Harvard University Press, 2006. I wish I had discovered this biography earlier in my unit development because I would have loved to have read it from cover to cover. The portions of the introduction and chapter on Passing which I read were well-written and a fascinating portrait of this woman who seemed to have been lost to history, but with a great deal of research and time, Hutchinson offers a new perspective. Larsen, Nella. Passing. Ed. Carla Kaplan. New York: Norton Critical Editions, 2007. This Norton Critical Edition includes some really excellent materials that can be useful in the classroom, including historical background of the time period, contemporary reviews of the novel, including one by W.E.B. DuBois, and commentary on the issue of passing. I would also point out the articles on the Rhinelander case, which provides an interesting legal perspective on the issue of race, class, and social status, and which is mentioned in the text of the novel. Larson, Charles. Invisible Darkness: Jean Toomer and Nella Larsen. Iowa City: University of Iowa Press, 1993. Pages 55-91; 184-195. Larson’s biography focuses on two writers for whom racial identification is biographically and literarily significant. The sections on Nella Larsen are noted above and I found the information interesting and worth a read. Romare Bearden: Southern Recollections. London: D Giles Limited, 2011. This is a beautiful book published for the Mint Museum Charlotte in honor of Bearden’s centennial. It contains color reproductions of dozens of his pieces and essays by art scholars and museum curators. It offers some important background and textual information on Bearden’s life and process. Larsen, Nella. Passing. Mineola, New York: Dover Publications, 2004. This is the webpage from Brown University that showcases The Dew Breaker as the summer reading book for 2010. It is worth a look because of the links provided for more information on Haitian history, including the Duvaliers and the Tonton Macoutes. According to the website, “The Romare Bearden Foundation was established in 1990 as a non-profit organization by the estate of Romare Bearden (1911-1988) to preserve and perpetuate the legacy of this preeminent American artist.” There are several interesting aspects to this site, but I was most impressed with the interactive timeline of Bearden’s life which gives not just dates and facts, but pictures and artworks as background as it scrolls left or right. This website, created and directed by University of Washington professor Quintard Taylor, is a reliable resource for several historical aspects of this curriculum unit that may be of interest to teachers and students. It contains an encyclopedia, primary documents, and speeches; the entries are generally short and readable while still providing a solid overview of the topic. For example, the entry on Tonton Macoutes gives a contextual summary of the Haitian militia as well as a reference to the folklore character, provides a photograph, and a citation for five academic sources to corroborate the information. In September 2011, to commemorate the centennial birth of Romare Bearden, one local magazine produced an excellent article on Bearden relative to his Charlotte connection, family, and artwork. Richard Maschal, the writer, interviewed Bearden in 1980 and wrote an obituary for him in 1988. This is precisely the kind of article I would encourage students to read by posting it on my webpage. In 2003, The National Gallery of Art published “The Art of Romare Bearden,” a guide for teachers which coincided with an exhibit of his work at the museum. I highly recommend perusing this website and the PDF for help understanding Bearden’s life, work, and significance. There are also some interactive activities for students that break a piece into individual components and encourage the students to engage in a conversation with the text. aginati�C>oePbpHut-grid-align:none;text-autospace:none’>Recollections of Charlotte’s Own Romare Bearden. Mint Museum of Art, 2002.